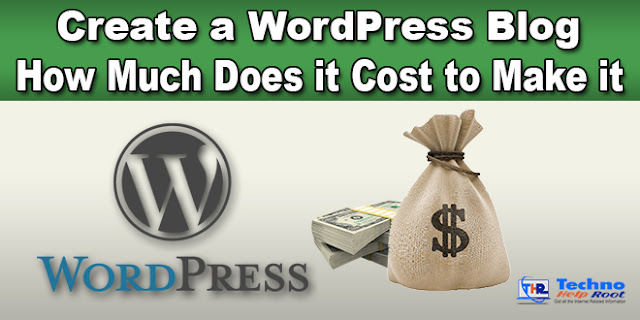 Create a WordPress Blog: Hello Friend's in today's article we are going to tell you that a Create WordPress Blog, you can make a Professional Blog by spending at least how much money it cost. There is no shortage of bloggers on the internet today, many people want to be a blogger today but they do not know that a Create WordPress Blog, how much money does it cost to make it and at least how much money they could spend. First of all, let us tell you that on the internet you are told that you have to buy this thing and buy that thing. If you have to pay for all the things, then we should first clarify that there is nothing like that. You need to have some limited things that you only need to buy from trusted websites and after that, you need some guidance after which you can easily Create a WordPress Blog with very little expenditure. To understand a How to make it, you need to know that what you need to Create a WordPress Blog is because the price is divided between them. To create a Professional / SEO Blog, you have to take at least one Custom Domain. For which you get different offers on different websites. We will suggest that you buy a custom domain from Godaddy or Bigrock, then you get High Profile Domain Names such as Rs.130 with All Taxes (.com, .org, .net). Similarly, if you want to rank your blog in India then you can register with a domain like Rs-110 with all Taxes (.in, .co.in). A Benefit to Purchase Domain from These Websites You find that if you do Purchase Domain Name from Hosting Provider Websites then you have to pay up to Rs 750- Rs 1000. To get hosting, you get lots of cheap offers on the internet but they only share VPS hosting and contribute with everyone, so do not come to the point of any offer or person because you have a Professional Work and such people do not always support you, so you only buy Hosting from Trusted Websites. Hostgator and Godaddy are hosting you best in lowest and lowest price. Most WordPress Bloggers Buy Hosting from Hostgator, so you are better off buying them as they have good customer support as well as their plan. Now because you are creating a first time WordPress Blog, you may need a lot of technical support at the beginning. Before Purchasing Hosting Blog for WordPress Blog, you must select the correct Plane because if you only have to run a blog, then before starting, you should take a Single Hosting Plan of 6 Months as you can get it in very little money and you can You will be able to become a Wordpress Professional in 6 months, after that you can take your plan accordingly. When you start blogging, you first have to pay attention to the design of your blog. Themes are now available on WordPress, but they are only for Limited Time Period, so in the beginning, you should use Themes provided by WordPress. After this, when you get Earning from your Blog Start $ 40- You can buy any theme up to $ 100. There are so many Blogs / YouTube Channels available on the internet that you provide Free Tutorials so you can easily learn how to Create a WordPress Blog. So you do not have to pay anyone to do this work. You can install WordPress on your own and customize your blog by using your own according to Plugins. WordPress is more popular than SEO Purpose but for Professionally Use to Use SEO Plugins you have to purchase them for which you have to pay $ 700 to $ 1000 but it can also be used in free with all the Plugins Limited features. In which limited service you get all the things you need, so long as you do not have Earning from your Blog, you do not need to buy any Plugin. Earning from any blog is most important for Traffic for which you need to pay but if you use a little bit of hard work and a few techniques you can promote your blog well enough. To create a Professional WordPress Blog, you only need to pay up to Rs.1500 to Rs.3000, Custom Domain for 1 year and Single Hosting for 6 Months. You can easily earn Earning from your Blog till 6 Months, and after that, you can continue your Blogging with the money earned.